Part surfing and part canoeing, this rapidly-growing water sport originated in Hawaii, and packs a punch of a workout, especially for your core. 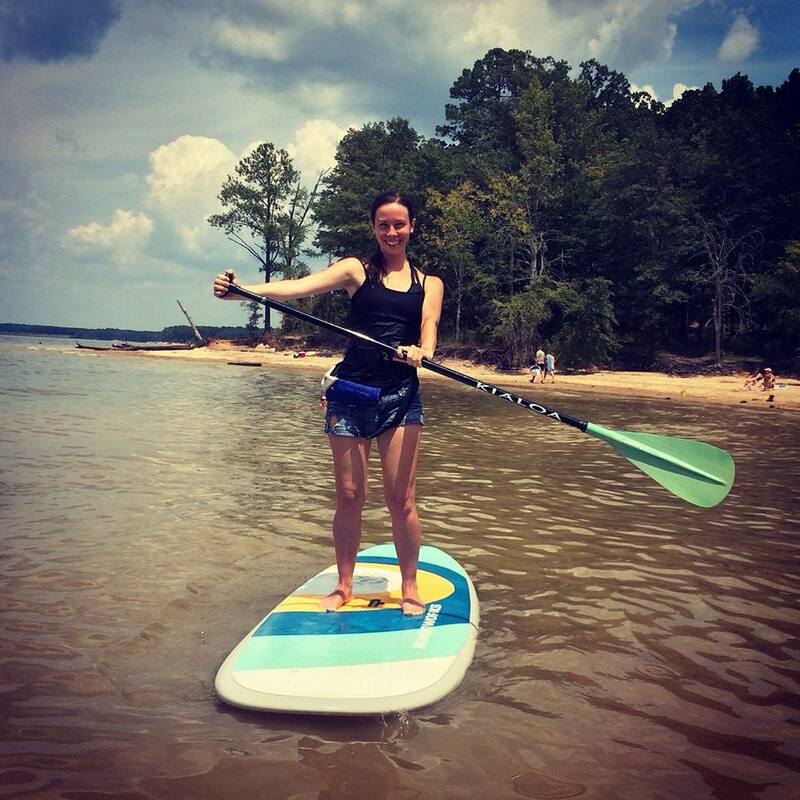 Now pretty much offered at any body of water in the world, I found myself with my toes in the sand as I carried an 11-foot paddle board and its accompanying paddle toward the gentle shore of beautiful Jordan Lake. Picture taken by Allison of LYF SUP. Since it was my first time paddle-boarding, I joined a class with five other adventurers and a spirited, positive-minded teacher named Allison. She explained everything about the paddle-boards and paddles (which she provided), the proper way to stand and use your paddle, and answered any questions we had. Then it was time to push our boards into the sea-green lake to find out for ourselves. Everyone in the class (aside for one woman who had previous experience) was a bit wobbly at first, and somebody flopped into the water on her first try at balancing, but we were all up on our feet fairly quick. We followed Allison out to the deeper water, paddling away and getting used to the feel of the board beneath our feet. While it was a peaceful journey gliding along the water, it was also a fantastic workout (I feel it in my thighs today), and the sun was beaming down on us the entire time. One thing I recommend that I didn’t do myself is to make sure you’re hydrated before heading out. We each paddled at our own pace, and learned how to turn left and right, completely around, and how to stop. We also got to paddle on our knees and on our bellies. I felt like a surfer — cowabunga! Since we shared the lake with boaters, people on jet skis, and swimmers, we had to learn how to maneuver around any objects that came in our direction. Whenever a boat or jet ski went by, the waves would ripple below, making standing a bit challenging. I almost fell numerous times, but caught my balance or squatted down. Before I knew it, our two-hour lesson was up, and we paddled back to shore however we liked. Some stood, others kneeled, one guy cruised up on his belly. I did a mixture of the three, and even tossed myself in the water to cool off (as did everyone else, including Allison). I felt accomplished at the end of class, but would have liked to stay out on the board all day to sharpen my skills. It was a gorgeous day — the perfect one for paddle-boarding. I enjoyed the benefit of a core-strengthening workout while having so much fun, and I think I could say the same for everyone who paddled beside me. 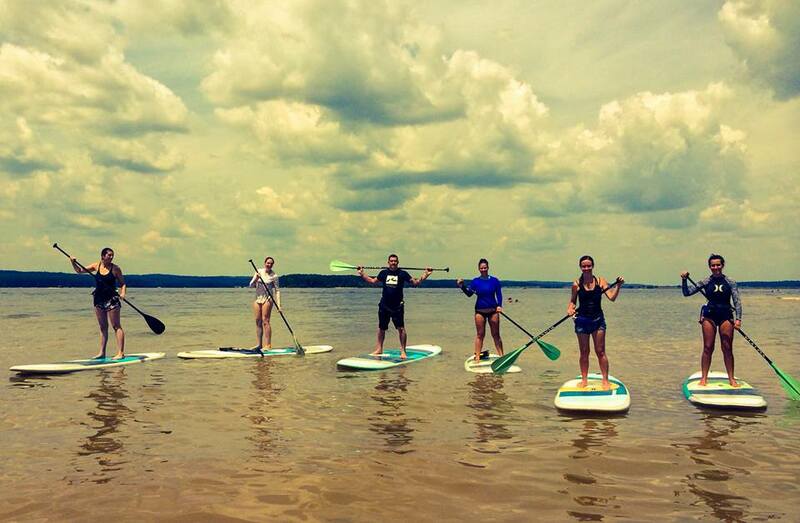 Stand-up paddle-boarding is an amazing way to get out and try something new. It’s easy to stand once you find your balance, and you will only get better from there. If you’re reading this, you must be interested, so get out there and make a splash (even if that means falling)! Look at you Nicole ! You´re having some good fun for sure, I would just lie down on that board, which actually seems enormous and rest, get a good tan and then pay somebody to push me on to shore. Resting on the board was just as fun as standing on it and paddling! Jordan Lake is located in North Carolina (but I bet you googled that already).